I realised that I never wrote about it in my blog, so this post will also be an introduction to the event in general. 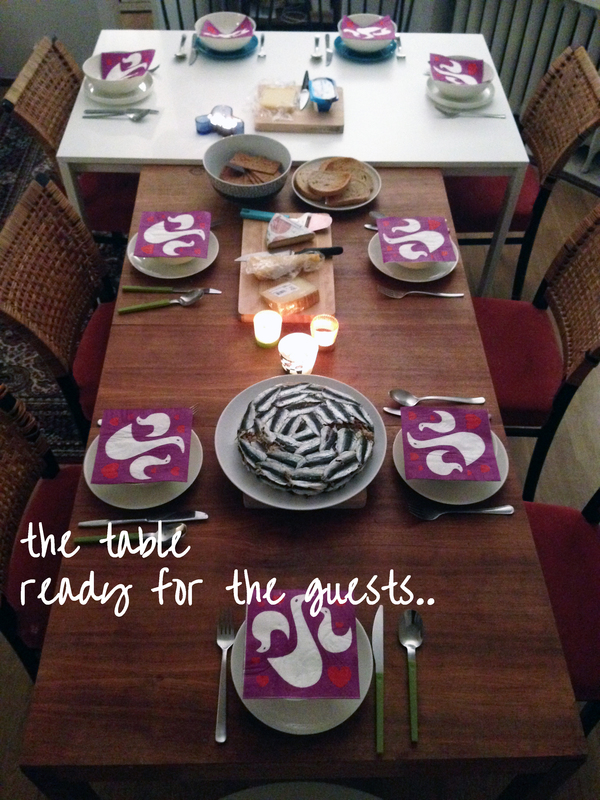 “My Dear Kitchen in Helsinki Recipes Evening” is an event that I create on Facebook and spread the word via my social network. In the future, I plan to extend the announcement of the event to other platforms but for the time being, it is only through Facebook. So what happens in this event? Very simple: friends cook my recipes and we taste them altogether! For each event, I choose several recipes and publish the list on Facebook event page. There are always 2 types of participants: cooks and tasters. The cooks prepare the food, whereas the tasters are responsible from drinks and from, well, tasting! By doing so, I get to test if the recipes are working, the cooks have the opportunity to try cooking something new for them and share with people that they may / may not know and the tasters, being responsible from the drinks, get to think about drinks that would suit the food (and since everyone can see the recipes openly, they know the ingredients and so they can try to find the most suitable drinks, like a type of wine, accordingly). What do I do? I host the event in my dear kitchen, prepare the space and I cook one dish that I haven’t yet published on neither the blog nor any social network site. In the latest session that we had last Saturday, February 22nd, there were 3 cooks (plus me as a cook/host), and 5 tasters. There would be one more cook, preparing French macarons, however flu got the best of her right before the event. So we were robbed off from the macarons, but the others were just great. We started the dinner with “Turkish soup with couscous balls and chick peas”, cooked by Anja, a German friend of mine and my ex-roommate. She loves this soup ever since I first cooked it while she was still living with me, and she even bought many jars of dried mint just to make this soup as much as possible, the last time she was in Berlin, couple of weeks ago. 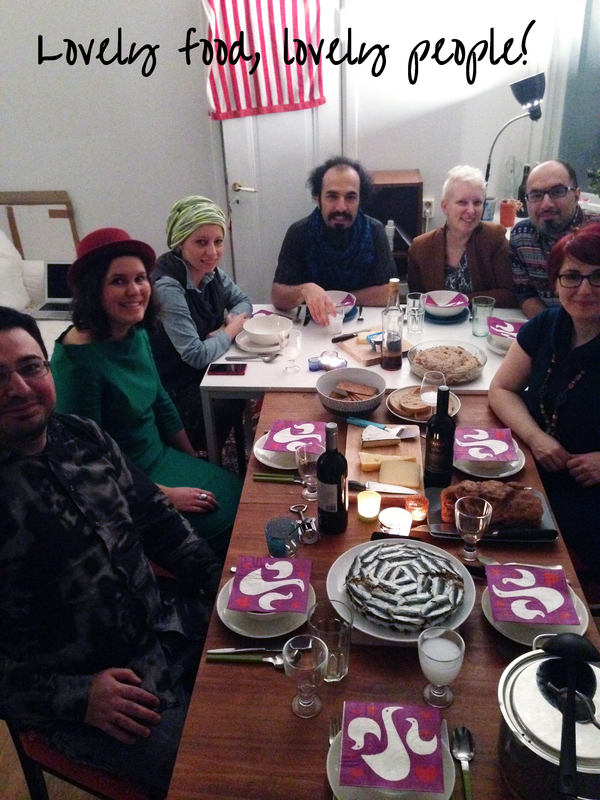 After soup, we continued with “Cinnamon, Raisin and Walnut Bread” baked by Nihan, my Turkish friend living in Helsinki for a quite long time. Her bread was simply delicious, she said that she was not happy with the look of it, but she had the most important part perfectly: the taste. 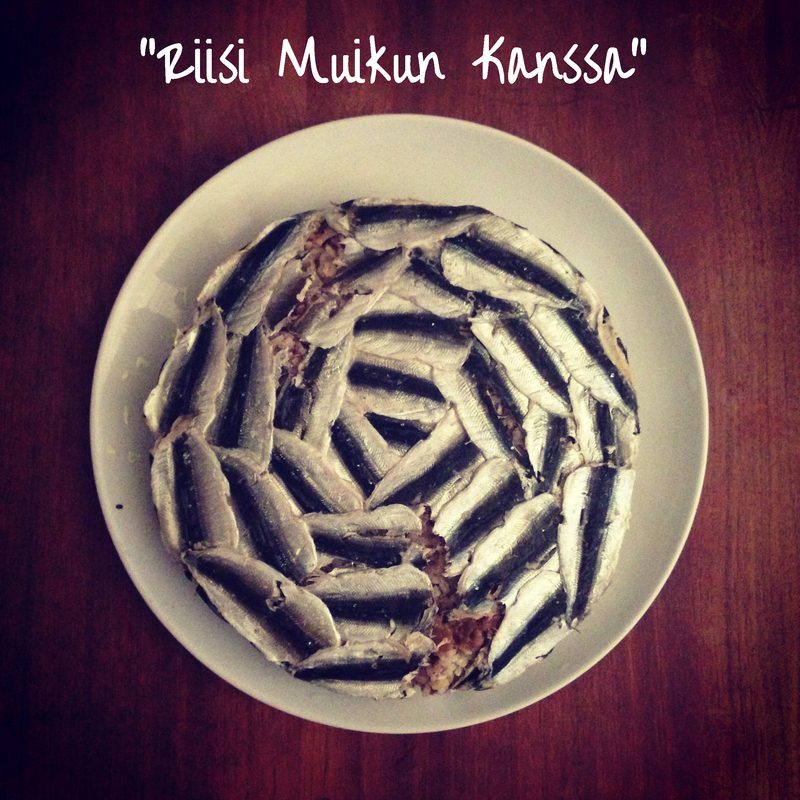 When everyone tasted the bread, either just the bread itself since it already had quite rich taste thanks to many ingredients, or with some cheese, I served the main dish, “Riisi Muikun Kanssa – Rice with Cisco”. This was a version of a famous Turkish dish from Black Sea region; instead of European anchovy which can be found in Black Sea, I used Muikku – Cisco, a similar fish (well, as similar as possible let’s say..) that I could find here in Helsinki. It still tasted very similar to the real dish though! And the recipe to this dish will be published in the blog soon.. Finally, after the main dish, we had the dessert, “Tahini Roll”, baked by Jana. A dear Macedonian friend of mine, Jana actually made the tahini herself as well – so she took the recipe one step ahead in my opinion. There was still a bit of roll left next day, and it was just lovely to have it with some tea on Sunday evening..
As for the tasters, Baris, Aneta, Laura, Gian and Sirvan, they brought red & white wine and beer. We all enjoyed the food while enjoying the wine that tasters brought and I could tell from their faces that they loved the food! Besides eating, there were interesting and very enjoyable discussions on food, cooking, and of course, as it happens in any event involving foreigners around a table in Finland, we discussed Finnish culture and how we interpret things. I hope that Laura, our only Finnish friend on the table enjoyed our comments too! Previous PostSalty Sesame Sticks – For The Next Tea Time? Next PostHappy birthday to My Dear Kitchen in Helsinki!